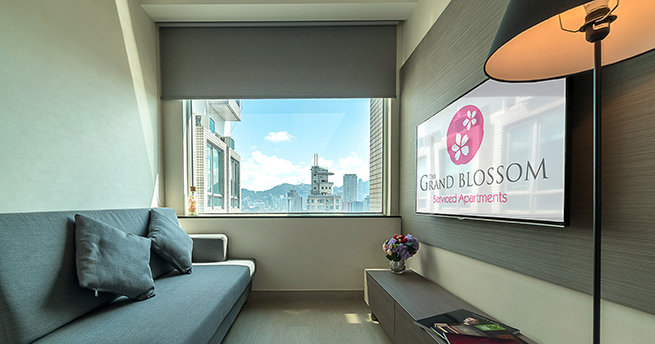 If you need to be in Kowloon, then the Grand Blossom is where you should “hang your hat”. This modern serviced apartment is located in the heart of Hung Hom. The neighbourhood has a very local vibe, with numerous eateries and mom/pop shops. The bustling Whampoa shopping area is only a 10 mins walk, offering more dining options and a cinema. If you need to venture a little further, the newly opened Ho Man Tin MTR station is only 3-minute walk away. The Grand Blossom is the perfect home for families. They offer 2 and 3 bedroom suites ranging from 700-763 sq. ft. Monthly rates start from HK$23,000 up.